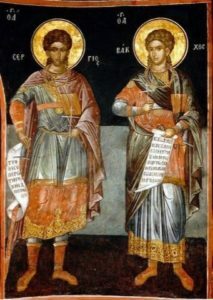 These holy Martyrs were Romans of high rank in the service of the Emperor Maximian, to whom it was reported that they did not take part in the festivals of the idols. When he called them into his presence, they confessed their Faith in the one God. He had them arrayed in women’s clothes and paraded through the streets in mockery. They were afterwards scourged, from which Saint Bacchus died. This was about the year 296. Saint Sergius was then taken to Resapha in Syria, where he was tortured and beheaded. His tomb in Resapha became a very famous shrine, to which pilgrims came from as far away as Western Europe; Resapha was later renamed Sergiopolis in his honour. Just recently, within the last month or so, our Ecumenical Patriarchate (it’s Synod of Bishops) made a rather progressive decision that has been a long time coming. It was a decision that many clergy, including numerous bishops, thought was very important to the health of the Church and church. I will discuss this at the end of this article and expand upon it, albeit briefly, in church on Sunday. We need to return to the year 692. It was the year that Justinian II, Emperor of Byzantium, decided there needed to be another “ecumenical” council to iron out some controversy in the Church and reinforce decisions made at the 5th and 6th Ecumenical Councils. They were in 553 and 681: both were in Constantinople. This Council met in Constantinople also, but it was not considered the 7th because the whole Church did not accept it as binding on them. It was called the Quinisext or Penthekti or Trullan Council. However, many of the “disciplinary” canons of Quinisext were not accepted by the Pope, and even though most of them were not completely observed by the East, they contributed appreciably to the widening of differences between East and West. Many of the canons formulated related to the marital status of the clergy and others regarding the age of ordination for deacons, priests and bishops. Others had to do with obstacles to marriage and the practice in the East by which marriage could not be entered into once you had been ordained to one of the three ranks of priesthood: deacon, priest and bishop. Rome’s practices were different and they didn’t want to change their practices based on the decisions of Quinisext. There has been much discussion, controversy and change regarding the issue of ordination and marriage in the life of the Church from as early as 306 in the West. And some Popes vacillated. Most, since that time, were in agreement that clergy should be celibate (unmarried). There was a Pope in the 400’s that didn’t think that clergy should have to “dispose” of their wives to remain in the priesthood. But the final and current position of the Roman Church was enacted in 1917 forbade the ordination of a married man. Of course, that doesn’t hold true for married clergymen from other denominations who become Roman Catholic. (Another story for another day). In the Eastern Church, marriage for clergy was limited to before ordination for deacons and priest. Bishops have, for a long time, been chosen only from the single (celibate or widowed) clergy. Also, married clergy (deacons and priests) could not, and have not been able, until most recently, to remarry, even if their wives had died or left them. This policy had put many deacons and priests in a very difficult position, and created an unnecessary burden, especially if their spouse died young or if their spouse “flew the coup” and abandoned them. Many have been left with younger children to raise alone. A difficult task for a couple. An almost impossible task for a now single priest. This policy has forced many young men to leave the priesthood and pursue another career in order to raise their children. Please keep in mind that these men chose to be married clergy and were now forced to remain single and celibate to continue in the priesthood. This is not to say that in other jurisdictions, Antiochian for example, the hierarchs may have allowed the remarriage of widowed or divorced clergy. They did, albeit rarely. NOW to the piece de resistance. Interesting to note: Not everyone who is widowed or abandoned is interested in remarrying. Also, for those who are, they may not have met someone, at this point, whom they wish to marry. But to know that it is possible provides great solace and encouragement to those clergy who find themselves in this very difficult position. One primary concern by bishops was generated by the laypeople being scandalized at the thought that the priest might be dating. I, personally, think it’s time “y’all” get over that thinking. Church Music Sunday Today is the day parishes across our Archdiocese honor the gifts and stewardship of the church musicians of our parish-our clergy, the choir, our chanters, and those who teach the hymns of our Church to our youth. Their contributions enhance our worship and assure that the glorious treasury of our hymnography continues to edify us and future generations. St. Demetrios Book Store for the generous donations to our Youth Ministries. 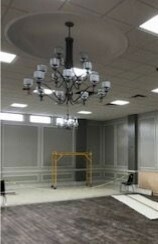 This kind gesture is greatly appreciated, and will benefit all of the children at St. Demetrios! 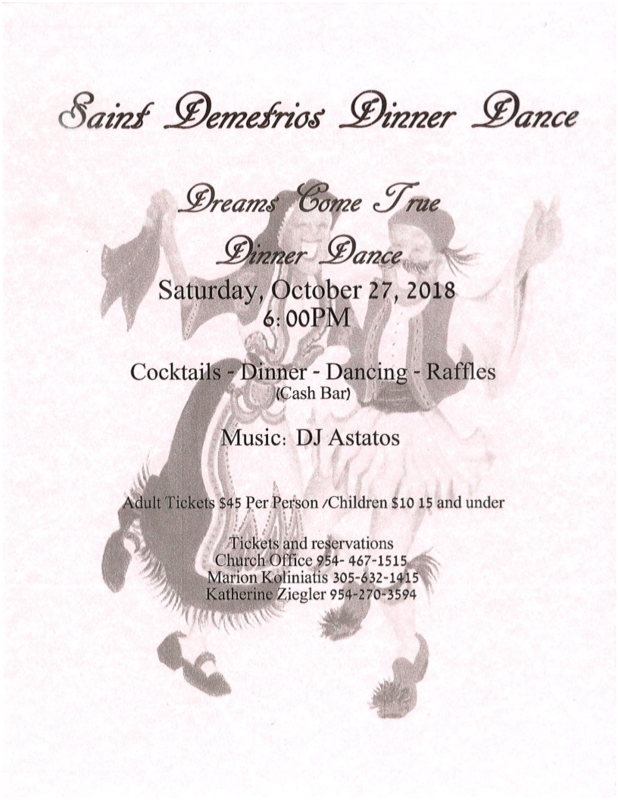 Dance There will be a mandatory meeting for the parents of all St. Demetrios dancers immediately following the Divine Liturgy on Sunday, October 14th, in the church. Please make every effort to attend, as the EYCC and Dance Advisory Council will be addressing several topics pertaining to our dance program. 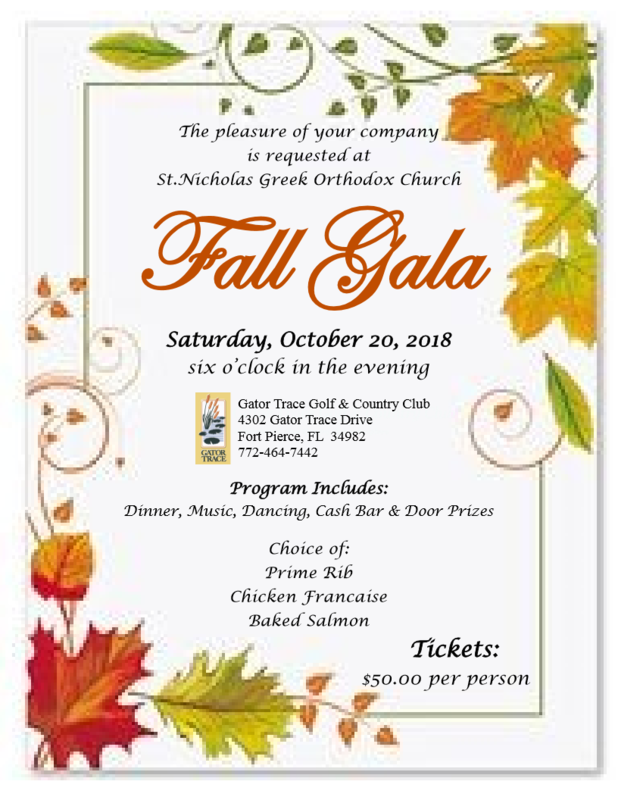 St. Demetrios Church Feast Day Dinner Dance Saturday, October 27th in the newly renovated hall. Tickets $45 per adult; $10 per child. 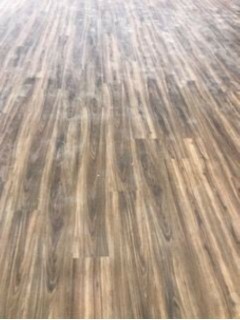 Available for purchase every Sunday or by calling Marion Koliniatis @ (305) 632-1415. DON’T MISS…. 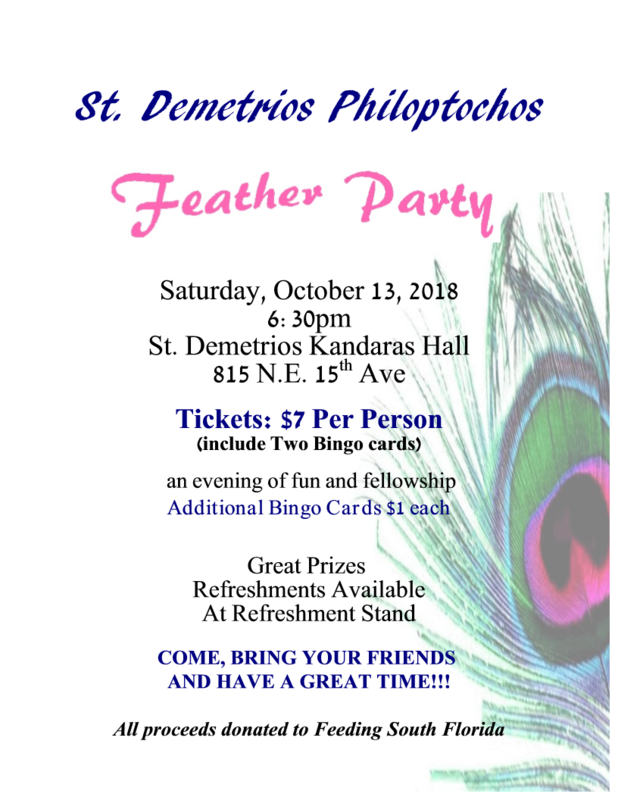 and plan to the attend the FEATHER PARTY on Saturday, October 13th, in the Kandaras Hall. Doors open at 6:30 pm. Tickets @ $7/person include 2 cards. Bring your family & friends for an evening of fun, food, & fellowship. Great prizes & refreshments. Proceeds benefit Feeding South Florida! BE SURE TO BUY YOUR TICKETS TODAY!! 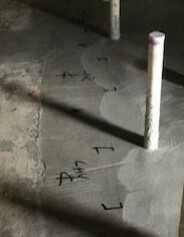 Large Hall Renovation · The ceiling tiles have been installed, the dance floor installation is in process and the concrete slabs for the bathrooms have been poured.